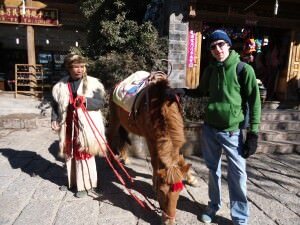 The charms of staying in Shuhe Old Town in Yunnan, CHINA. It’s no secret that I LOVE China at the moment. I was there 5 times last year as well as visiting Macao and spending most of the year in Hong Kong and I currently have a multiple entry visa for the world’s most populated country. 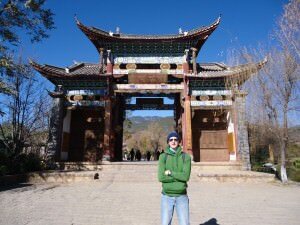 I’m now going to uncover a gem of a place for you to relax and experience some old style Chinese culture in Yunnan Province, AWAY from the crowds. 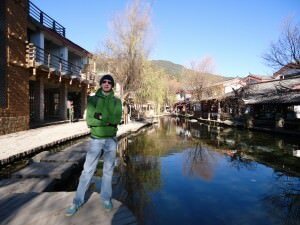 That’s right, Shuhe Old Town in Yunnan Province is off the beaten track, even if it’s next door neighbour city, Lijiang is most definitely not. First things first, how do you get to Shuhe Old Town? 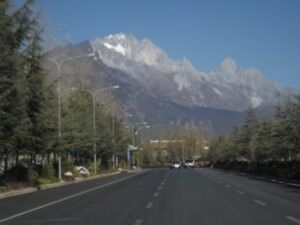 This street Shangri La Dadao has a view to the mountains and is where you can get a minibus to Shuhe! 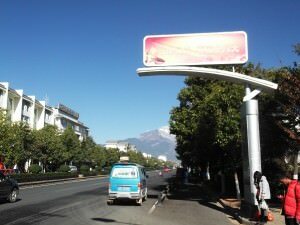 The Lijiang Passenger Station – on the opposite side of the road from this is a minibus stop for Shuhe Old Town! Opposite the bus station (not directly I might add, but close enough) you will notice Blue minibuses pulling over every now and then. These head directly to Shuhe Old Town! This side of the road you will see blue minibuses pull up – ask the driver if these head to Shuhe and voila – you’ve done it! Show the driver a map or the Chinese writing of Shuhe and that should confirm if its the correct bus or not. Hop in! The minibus will leave when its full. The journey takes 20 minutes or so and has some epic landscapes in behind! 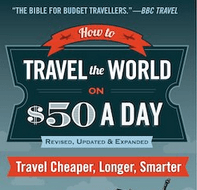 The bonus is that the price is only 2 RMB (as of December 2012)! Taxi is also an option but pricewise will be more expensive of course! The least preferred option, but this could be your only hope – simply hail one down, bargain your price and head to Shuhe Old Town. You might want to tell the driver you need a hotel too so he can drop you off near a hotel. There is actually a Hostelling International in Shuhe, though I stayed in a much cheaper, more local place! 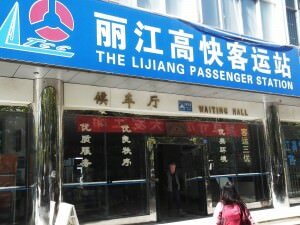 Don’t pay more than 30 RMB for a taxi – seriously we got one for 16 RMB at night. 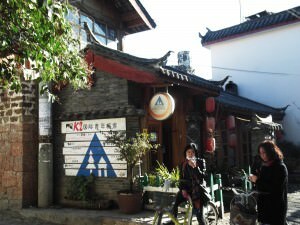 There’s a Hostelling International in Shuhe also known as the K2 – you could try asking them to pick you up. If you do stay at the Hostelling International, the K2, at the time of writing their website is not yet up and running, you can always ask them to pick you up at a cost and arrange things from there. There is also a hostel called Nomads in Shuhe. 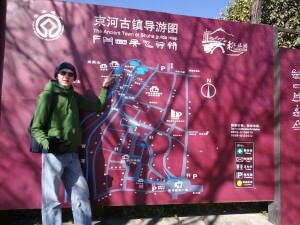 Please note that the entrance in the photo below is the main entrance to Shuhe Old Town and there is a tourist information place near to it (this is signposted) – likely they can put you on the right track accommodation wise too. The Main Entrance to Shuhe Old Town also has a tourist information place nearby. 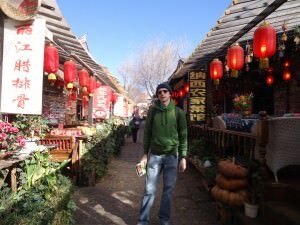 We didn’t stay in the K2 or the Nomads, we stayed in a place with a Chinese name, something like Zee Yau (Freedom Life Hostel) which was more local, cheaper, and very remote – on the edge of town basically. 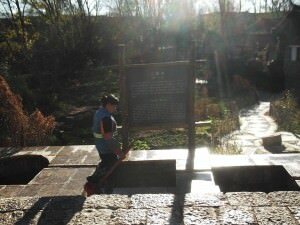 Around a 15 minute walk from the entrance arches to Shuhe Old Town. By the way, it helps having a girlfriend who can speak Chinese and organise these types of trips allowing me to get to remote parts of China. 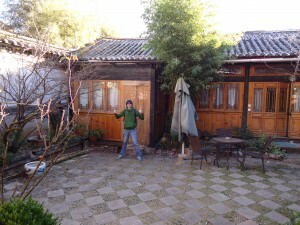 There’s a photo near the bottom of this post, and the cost was 120 RMB per room per night (there were 2 of us). So once you’ve got to Shuhe Old Town, relax in the friendly ambience of a typical Ancient Chinese Town which sits against a backdrop of mountains which eventually become Tibet. What is there to see and do in Shuhe? Standing on a rock overlooking the river at Pub Street in Shuhe Old Town! Lively by day and night, Pub street has a vast array of bars and restaurants. It is not busy and very easy to find a quiet bar to relax. Food is served almost everywhere here. The more local the pub, the cheaper it will be! You cannot miss Pub Street in Shuhe as it’s bang in the middle of the town and has a pretty setting with a river running along the middle of it. This is a true chill out zone. You’ll enjoy it! 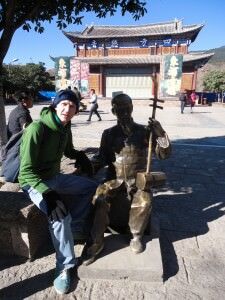 Relaxing with a fake local in the Music Square in Shuhe Old Town in Yunnan Province, CHINA. You want to hear some Chinese tunes by night? Head to this music square and join the locals. By day there’s also local guys singing in and around the square. Food Street in Shuhe Old Town! It wouldn’t be China without a Food Street now would it?! 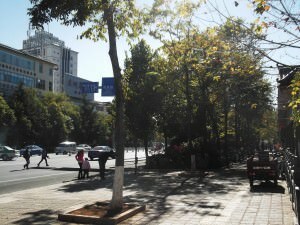 This street is quiet in the morning, getting busier by lunch time and can be cosy and crowded by night. I’m not giving you directions to these places by the way, as quite simply Shuhe Old Town is small and you WILL find them easily! They are even signposted! The main square in Shuhe Old Town – I loved the freedom of it all. Vintage China is superb. Even a small town like Shuhe has a main square. Tourism is big here so the main shops are near the square. On the edge of town, this is basically what the locals traditionally used as their means of water. One well is clean and safe for drinking, the second one is for washing and the third one is for waste. 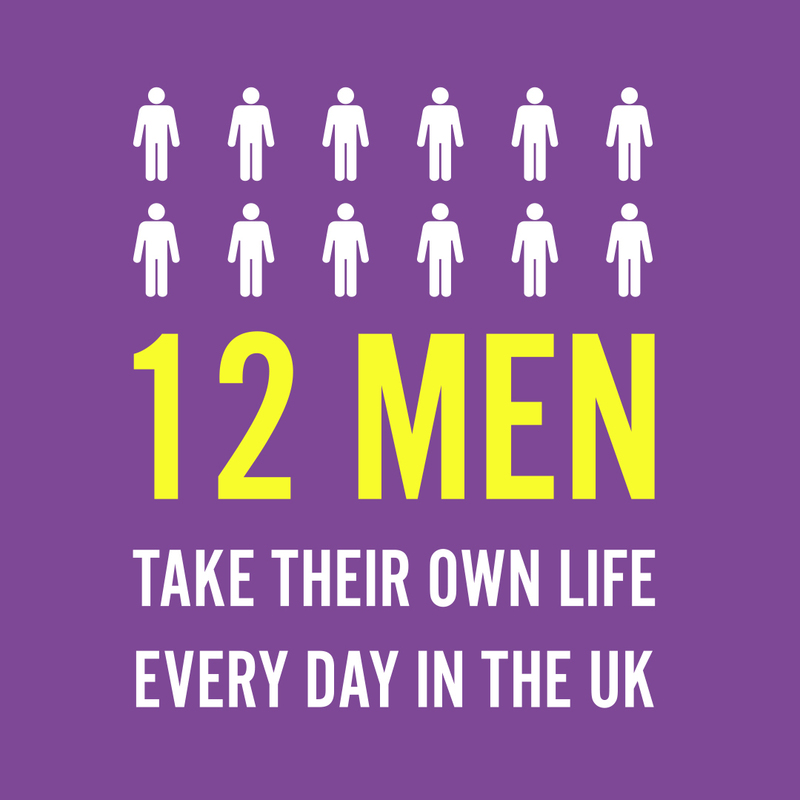 Bear in mind, I could be totally wrong there as well!! 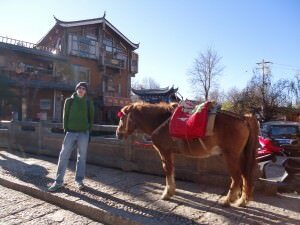 Take a step back in time and get on a horse in Shuhe Old Town! Take a step back in time and pay the locals to hop on a horse. Get your black and white camera ready for a vintage picture! China is cheap for souvenirs and Shuhe is a decent place to bargain hunt but I was travelling light on this occasion I didn’t buy any. 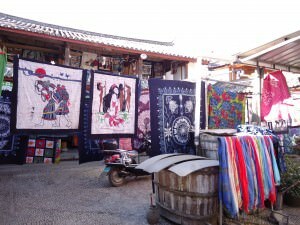 Traditional Tibetan and Yunnan gifts are available. There is a special shop for rugs and mats which I found interesting. You could hunt around for cabinet fillers for hours here! Food wise go for the barbecued meats! Tasty, available immediately and cheap! A lot of the local market stalls in Shuhe sell barbecued food. Take a chance if you like and just point to something and eat it. I tried lamb skewers, spicy yak skewers and pig blood rice skewers. These are all on sticks. 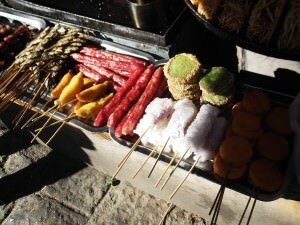 Typically decent selection of barbecued food in Shuhe Old Town in Yunnan, CHINA. The range of foods is awesome with the typical dried fish and squid featuring a lot. It’s all so cheap. 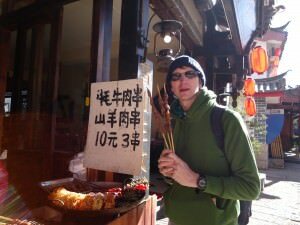 A skewer can cost as little as 2RMB! Cheap, tasty and instant! Trying Peach tea in Shuhe Old Town! Hot and tangy! OK so that’s not the real name of this product, but for 4-5 RMB you can get a hot cup of peach tea!! I had this early morning and it goes down a treat. It was winter and this was a worthy replacement to coffee. If you look around the main shops and cafes near the main square you might find the exact place I tried the peach tea. Worth it. Enjoying a Dali Beer on Pub Street in Shuhe Old Town near Lijiang! If you like to think you’re a ‘beer connoisseur like myself, head to Pub Street and night and try the local beers. Most of the Yunnan Beer is from Dali as far as I could tell so I had a Dali beer. It went down well, however sometimes I’m caught up in the moment and loving my surroundings, so don’t expect the beer to be amazing. But try it! 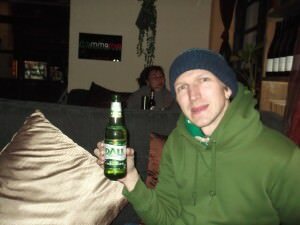 I wanted to experience Pub Street by night so I had a beer there, but you can get a Dali beer to takeaway for about 8RMB! Our hostel Zee Yau, Freedom Life Hostel in Shuhe Old Town. So that’s kind of it in a nutshell! The Old Town of Shuhe is totally worth seeing and it is quiet and relaxing. 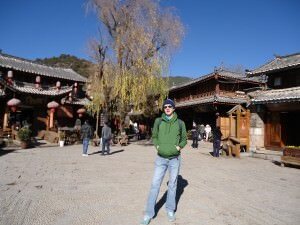 If you want to relax in Yunnan, Shuhe is a great place to do that away from the madness of Lijiang Old Town (the streets can be over touristy) and the Tibetan influenced Shangri La. This is a kind of photo drenched post as the pretty streets of Shuhe are a photographers dream, so here’s a photo taken by a passer by who caught myself and my girlfriend posing in the square! 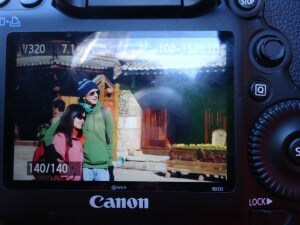 Caught on camera – myself and Panny Yu photographed in the main square in Shuhe Old Town by a passer by! English speakers? 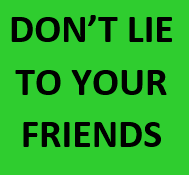 – Not really! Don’t Stop Living is dedicated to a lifestyle of travel!! 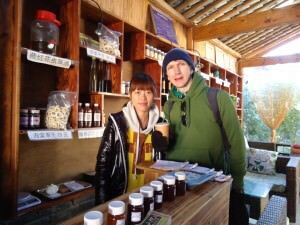 This entry was posted in Asia, China, Shuhe, Yunnan. Bookmark the permalink. ← Random Rant: This Is My Journey and I’ll Go Where I Want and Do What I Want! !